This Small Butterscotch Pie is from my friend Sue, at Basically Baked. The recipe is from a Mother’s Day cookbook Sue and her classmates put together back in third grade. Using recipes submitted (in secret) by the students), Sue’s teacher made mimeograph copies, then gave the children collections of recipes and let them make covers with construction paper. Sue’s mother kept the book all these years and gave it back to Sue on her last visit knowing she’d like it. She did, and probably more so because the book had one chili recipe and the rest were sweets! Now that’s my kind of cookbook. Sue’s contribution to the book was this butterscotch pie. It was originally made in a 7 inch pie dish, which seemed fortuitous since I’d just bought myself a little 7 inch pie dish so that I could make smaller pies. Sue re-wrote the recipe and made a modern version by microwaving it. I was pretty impressed with that, but my microwave skills aren’t so good so I made the recipe in a saucepan like the original and used the microwave just for warming the milk. Also, Sue used pecans in her pie. I left those out, but I did use her graham cracker crust and it was terrific and easier to slice than pie dough because it didn’t stick to the sides of the pie dish. If you’re cutting pieces from a 7 inch pie, a little sticking is a big deal. What I found with this pie was that even though it was made in the 7 inch dish, it sliced perfectly. By the way, the recipe makes a lot of meringue. 3 egg whites goes pretty far on a 7 inch pie, but I think that made the pie even more fun. It reminded me of a flashy diner pie, but in miniature. 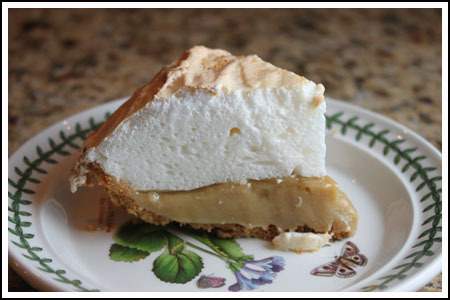 So far, this is my favorite butterscotch pie. If you want to scale it up to fit a 9 inch pie plate, I recommend multiplying all the ingredients times 1.33. If you want to stick with the smaller size but don’t have a 7 inch pie dish, I think you could get away with using a cheap aluminum 9 inch pie plate or a recycled tin from a store-bought graham cracker crust. Sue’s Small Butterscotch Pie is a scratch butterscotch pie made in a 7 inch pie plate. 1/8 teaspoon salt – note, Sue used ¼, but I found ¼ a bit salty. Crust: combine graham crackers and sugar in bowl. Stir in the butter. Press mixture into the bottom and up the sides of a well-greased 7 inch pie dish. Bake at 350 degrees F. for 8 minutes. Meanwhile, prepare filling. Whisk the egg yolks together in a bowl and set aside. In a medium saucepan that is not yet set over heat, stir together the brown sugar, flour, and salt. Now that everything is assembled, stop and prepare the meringue. It can sit while you do the next step. Combine the egg whites and the salt and mix on high speed with hand mixer until soft peaks form. Add the sugar 2 tablespoons at a time until the sugar is dissolved and stiff peaks form. Set aside while you finish making the filling. Warm the milk in the microwave for about a minute. Set the saucepan with the brown sugar mixture over medium heat and whisk in the milk. Continue to whisk over medium heat until mixture begins to simmer. Pour about half of the milk mixture into the egg yolks, whisking constantly, then add the egg yolk mixture back to the saucepan and continue whisking and stirring over medium heat until mixture thickens and bubbles. Whisk and stir for another 2 minutes while the mixture bubbles and cooks. This whole process doesn't take long at all -- especially if you use warm milk and a metal saucepan. Remove from heat and whisk in the butter and vanilla. 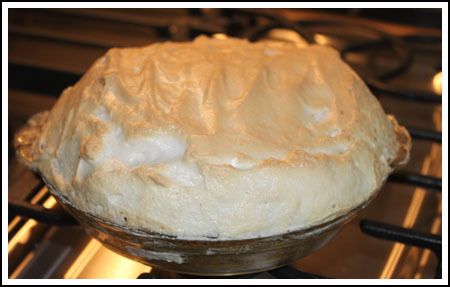 Pour into the prepared pie crust and quickly top with the meringue, sealing the edges. Bake the pie for 10 minutes at 350 degrees F. Let cool at room temperature for an hour, then transfer to the refrigerator and chill for 4 hours or more. I’m glad you liked the pie! It’s so cute piled high with all of that meringue. An aside… I made your Texas Sheet cake for for a large family gathering I went to. It was a BIG HIT!! oh man another butterscotch pie! do you know i’ve been swooning over the others you made? i mean i have yet to make them–this heatwave has my kitchen closed for a few weeks. but ever since you started posting butterscotch that’s all i’ve been craving. when we get ice cream i get butterscotch sauce or butterscotch dipped. LOL! Looks really cute. I’m pretty sure I’ve never eaten butterscotch pie. Love this! I love “mile-high” meringue. Those those “old” kind of recipe books, and written recipes. I got one written by my Grandma Tiny (died in 1984) while I was home last week for zucchini cookies. Kevin’s sister gave me a zucchini out of her garden yesterday. Perfect! Priceless are those kind of recipes. Oh we love flashy diner pies…they always call out to us from those glass cases and countertop cake plates…so of course this looks just amazing to us…with tons of meringue and all! For some reason, Mother always used whipped cream on hers. I think I might prefer it. It would cut the sweetness a bit. She also would make meringues, fill the centers with butterscotch and top with unsweetened whipped cream. It was my brother’s all time favorite dessert.